Anyone who uses Ardmore Blvd or Penn Avenue near the Wilkinsburg exit of the parkway should be aware of this information. There will be delays. 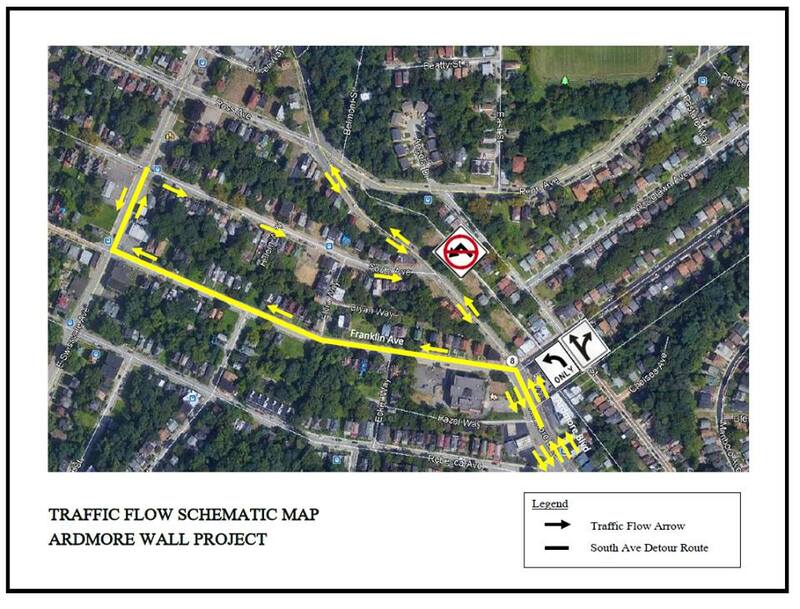 As part of the Ardmore Wall Revitalization project, traffic restrictions will be implemented starting April 22, 2019, lasting up to 12 weeks. Drivers traveling north on Ardmore Blvd will be restricted to one lane between Franklin Ave and Penn Ave. Left turns from Ardmore Blvd onto South Ave will not be permitted, and drivers will turn left at Franklin Ave using the posted detour route. The project is part of a two-phase gateway improvement project that includes refacing and repairs to the wall, re-establishing sidewalks, green-space improvements and a welcome sign. The Borough has spent the last two years acquiring and demolishing vacant properties above the wall as part of the project. The Wall repairs are made possible with the support of State Senator Jay Costa and State Representative Ed Gainey using a grant from the Pa. Commonwealth Financing agency Multi-Modal Transportation funds of $350,000 and matching funds of $306,000 from a Borough bond issue. The improvements to the green space and park area above the wall are made possible by a $475,000 grant through the Department of Community and Economic Development Keystone Communities Program. Work on the Ardmore Wall is being performed by Golon Inc. of Pittsburgh. All phases of the project are expected to be completed in 2019.